are always within our city limits. Whether you opt for a canyon setting or one on or overlooking the ocean, you can easily create the day of your dreams. Happily, there’s a venue for every budget. If a small, informal, outdoor wedding is your fantasy, you can get a permit from the City Community Services Department for between about $250 and $350.That allows you a two-hour time period at a number of beaches and parks. There are limitations as to the number of guests, and seating is a no-no, but you’ll be overlooking the Pacific! My personal favorite among them is Crescent Bay Park in North Laguna. It’s on an ocean front bluff in a residential neighborhood, so there’s no foot traffic to speak of, and the view of the coast looking south is beautiful. You can follow your ceremony with photos on the sand, and a celebration at one of our many hotels or restaurants. A vintage treatment for a vintage hotel. 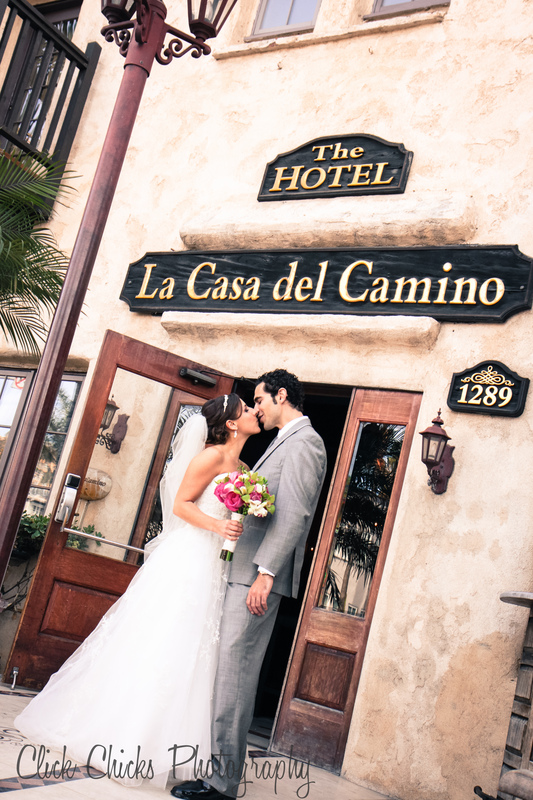 There are two boutique hotels that come immediately to mind for your special day. Of course, I always think of photography opportunities when it comes to selecting a wedding venue, and I absolutely love them both! Hotel Seven4One is a unique property where the fee includes all 12 of their guest rooms and event space for up to 100 guests. It was completely renovated in 2008 and epitomizes the chic and modern vibe. The interior courtyard is gorgeous, there’s a view deck at the back of the hotel, and proximity to the sand for those romantic shots everyone loves. Another is La Casa Del Camino, which offers a completely different feeling. “La Casa” as the locals call it, is a historic hotel dating to 1929. But don’t worry … it has been beautifully remodeled and has a laid back yet elegant atmosphere. You can take over all or part of the Rooftop Lounge for your vows and reception, while enjoying a backdrop of the gorgeous panoramic view up and down the coast. I love the small courtyard, which most people don’t even see, but I think the photos taken there have an old world European feeling and could’ve been taken in any number of small Italian villages. 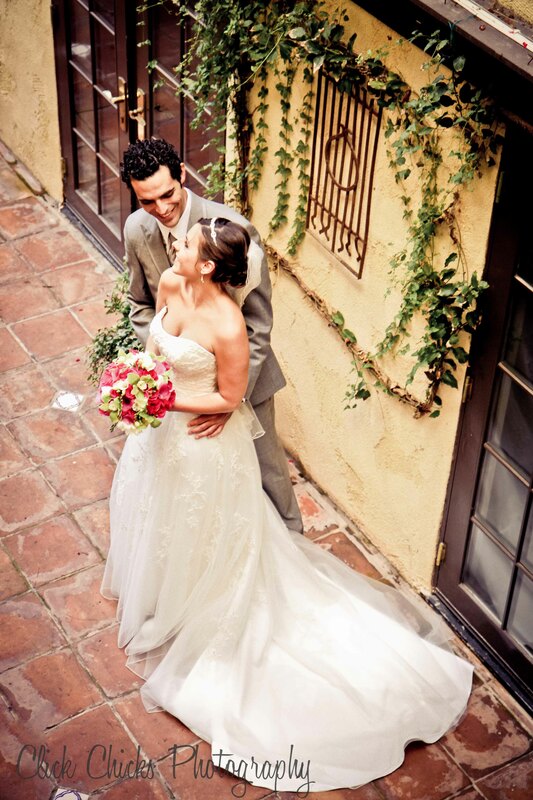 The small courtyard at La Casa is perfect for romantic photos. If a lush green backdrop is your choice, have a look at a pristine canyon setting of the Aliso Creek Inn Golf Course. Every time I’ve photographed a wedding there, the deer come out to play on the first green. After the ceremony, the on-site coordinator takes the photographer(s) and the couple out onto the course to some really special spots. If you say “the sky is the limit,” you just can’t find a more beautiful location than The Montage Hotel, in my opinion. Five-star all the way. Weddings are held on the lawn overlooking the Pacific, followed by the celebration in one of their elegant ballrooms. I’ve never actually counted, but I’ll bet there are at least 50 wedding locations within our mere nine square miles, excluding churches. Each is unique but they all have the undeniable allure of Laguna Beach.